Divinity: Original Sin 2 has a unique overall story with many side stories blended in to make one fantastic game. The story is basically this, you are a source user in a world filled with “Voidwoken”. When a source user uses their source abilities it draws these “Voidwoken” creatures and they destroy any and everything in their wake. Because of the potential to draw these “Voidwoken” monsters out have them wreck chaos; source users are rounded up and sent to Fort Joy. In Fort Joy source users are fitted with collars so they can't use their source abilities. Bishop Alexander is the one who decided this must be done and so it's up to the player to stop his ways of containing these source riddled people. The game starts out on a boat. This boat serves as a tutorial and will introduce you to many of the games mechanics. Like for starters they make you talk to people which is huge in this game. If you don't like talking to people then I wouldn't recommend this game. Another part they quickly introduce you to is the fighting mechanics. The fighting is one of the games strongest features. For each playthrough the fights can go any number of different ways. This holds true because with each playthrough you ideally will have a different party setup that will have other abilities and playstyles. This game is NOT mechanically demanding by any means. It is more about strategy than anything else. Given it's turn-based combat, it leaves the twitch and reaction gaming for other titles. You will have to take note of inventory, party abilities and placement of heros to overcome your enemies. Oh boy where do I start? You can basically do anything you want in this game. You can be a necro summoner archer undead dwarf if your heart desires. You can be the front lining cleric who tanks and also supports your team with heals and buffs. The list of class combinations is so enormous, I feel like the best way to know what you can potentially be, is to look at a class list and let your imagination run wild. It’s almost unfair to say there are classes in this game because the only real classes are the ones you pick in the character creation screen. Searching high and low for specific quest items or people is a major function of this game. Finding hidden areas adds a rush to the game because you never know what you could find in these spots. It could be a trove of treasure or a dragon's lair! You can never be sure unless you hold your breath and muster up the nerve to check it out. This part is crazy awesome. When you are in combat you can inflict some crazy elemental combinations on the enemies. For example, if you were to cast a necromancer spell for a blood surface then electrify it, you can create electrified blood which can stun your enemies! You can even throw a giant fireball down and add a curse spell on top of it to create “necrotic fire” which burns your enemies alive. There are so many choices and mixtures that can either turn the tide of battle or wipe your party. Choose carefully! Let me start this off by saying there are a ton of spells. It starts off with the basic level of spells and gradually works its way up to much stronger abilities as your character progresses in level. With each additional character level up, the vendors in this game will restock their supply with new spells and equipment. Overall, I thought this was a neat mechanic of the game and it doesn't overwhelm new players. This is probably my biggest gripe of the game. I thought the idea of the crafting system was awesome but there are a few problems with it. I understand the idea that you should experiment with different items to create things but staring at the same screen trying to make a dagger for half an hour isn't fun. There are books in the game that let you learn how to make specific things which is great but typically the kinds of items and armor you make are not super great at higher levels. Once you finally learn how to make things you come to the realization that they will never be as good as things you can buy off vendors (this is mostly true for higher levels) and even the vendors have wacky gear combinations (because of the crazy class combinations) that you don't really want. A bettter system, would be something that would let you “allot” a certain amount of points into stats or something of that nature. For example, instead of making a boring plain knife without a rune slot or any stats, you could instead make a knife that has +5 finesse and a rune slot. One of the most annoying things I bring upon myself, is that I like to collect everything. Just in case I need that specific item much later in the game or for a quest or something, I will just hold onto everything. The problem with this is that when you decide it’s time to “clean up” and manage your inventory it seems slow and rather annoying. This is especially true if you have to manage 4 peoples inventories (remedied by having one character loot everything) and hand out potions etc. The best setup is usually to be near merchants (HERE YE HERE YE) so, you can sell unwanted items. The problem though is that the NPC’s around you like to repeat the SAME ! @#$ing voiceline every 3 seconds without delay. This was certainly an annoying aspect when I wanted to clean up and sell things in my inventory. There are 4 difficulty modes for this game. I played this game on Tactician Mode and I have to say this game was pretty difficult. At some points I wanted to scream “This is just unfair!” but, that's what I signed up for. My best option was to strategize the fight and mix things up in order to succeed. This game pushed me a lot to get “creative” with mechanics (Hello rupture tendons + teleport) but not necessarily abuse them. I'm just glad I didn't talk myself into doing the Honor mode for the first time as I probably would have gotten so demoralize I never would have finished this game. You bet! There are achievements for this game. You can “stop and pop” a save anytime you want! The beauty of this addicting game is that you can literally save almost anywhere and anytime in this fantasy world. The only exception is you can't save during cut scenes! It's also hard to put a time expectancy on this game as each quest varies a lot on the person doing them along with the difficulty of the game. Just remember, you can “stop and pop” a save anytime you want! The game length was well over a hundred hours when I first beat it on tactician. (I did some multiplayer with friends so my time played is a bit skewed) The time I'm showing on Steam is roughly 133 hours played in game. Give or take a few hours because of playing with friends. This game is not overly demanding and can be played on a range of PC hardware over the past 5 years. Because of it's laxed hardware needs, this game can be purchased and played at a reasonable frame rate (60fps) for most users. 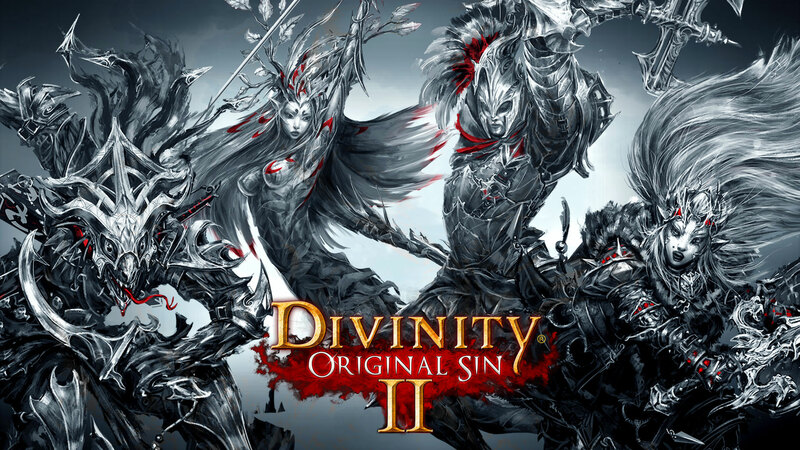 Divinity: Original Sin 2 is a game that I feel like everyone should play at least once whether its on Explorer or Honor mode. It plays a lot like Pillars of Eternity did but much better. (Sorry PoE you are still an amazing game) The crazy amount of class combinations (Healer fire ranger? Sure why not!) allow for almost anything a person can think of to let them live a “fantasy” of their own. The gear and armor feels and looks slick so you can get that “I'm a mighty lizard warrior who wields giant two-handed swords but is also of noble decent look”. The role play potential in this game is massive which allows for you on your own or with a group of friends to create a different kind of playthrough each game. Because I had so much fun playing this game by myself and with friends. This game is highly recommended, if and ONLY if, you enjoy turn-based combat and story driven games.